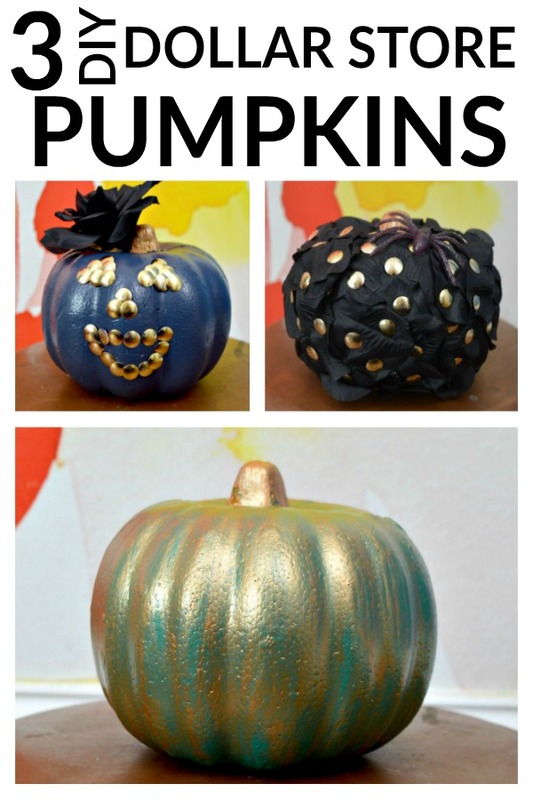 My favorite part about these three pumpkins is that there should be a favorite for everyone. They have three totally different looks and that’s kind of where the idea of naming them came into play. So, please, let me introduce you. She’s brooding and wears a lot of black eyeliner. She loves anything with gold studs. Also, apparently, she doesn’t mind having spiders right on her face. I’d watch out for this one. Millie is quick with a smile and holds true to the classic mantra, Big Hair, Don’t Care. Also, Always Put a Bow On It. Or a flower in this case. Ann is a hang-back kind of girl. She’s not the first girl you spot at the party, but if she catches your eye, you won’t look away. And her styrofoam skin *almost* looks like snake skin, so perhaps she’s not as demure as she seems. No need to take a vote on this one. I am definitely crazy. I might as well embrace it. I’ll just get to the Tutorials, ok? Craft Paint – Various colors – I used Dark Blue (actually I used left over Hale Navy BM Wall Paint on Millie), A greenish color, white and some copper to accent. I’ve used that copper paint on a thousand projects and I adore it, btw. Great one to add to your craft stash. 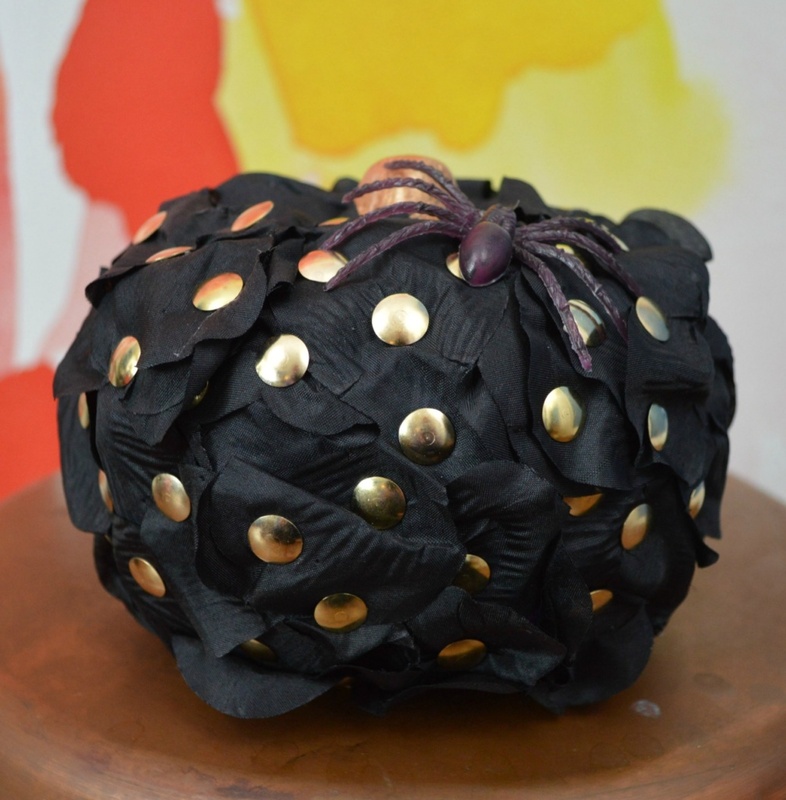 Dollar Store Black Roses – They come with the spiders in the bouquet! 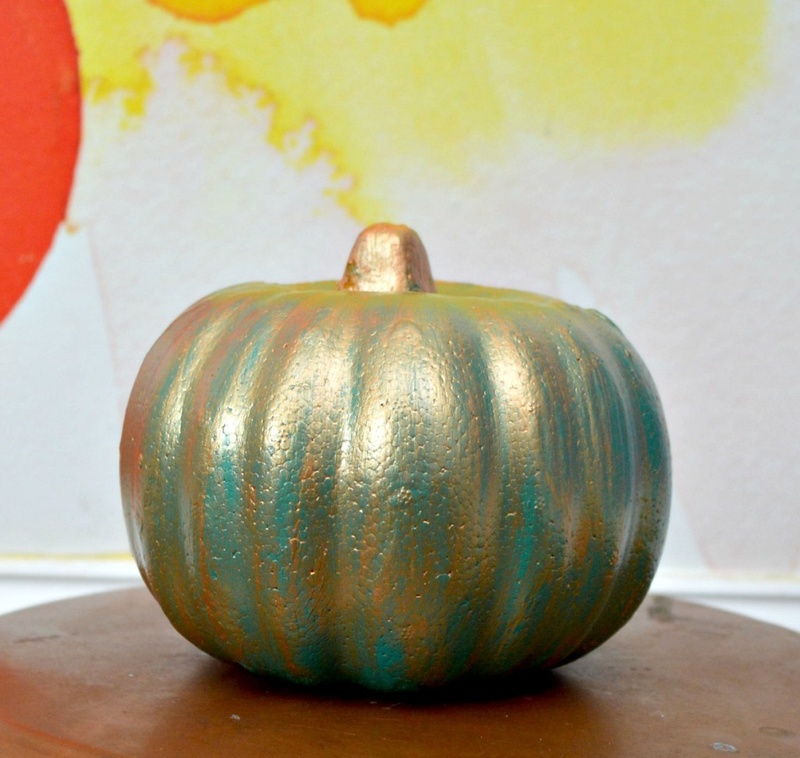 Paint your Pumpkin. 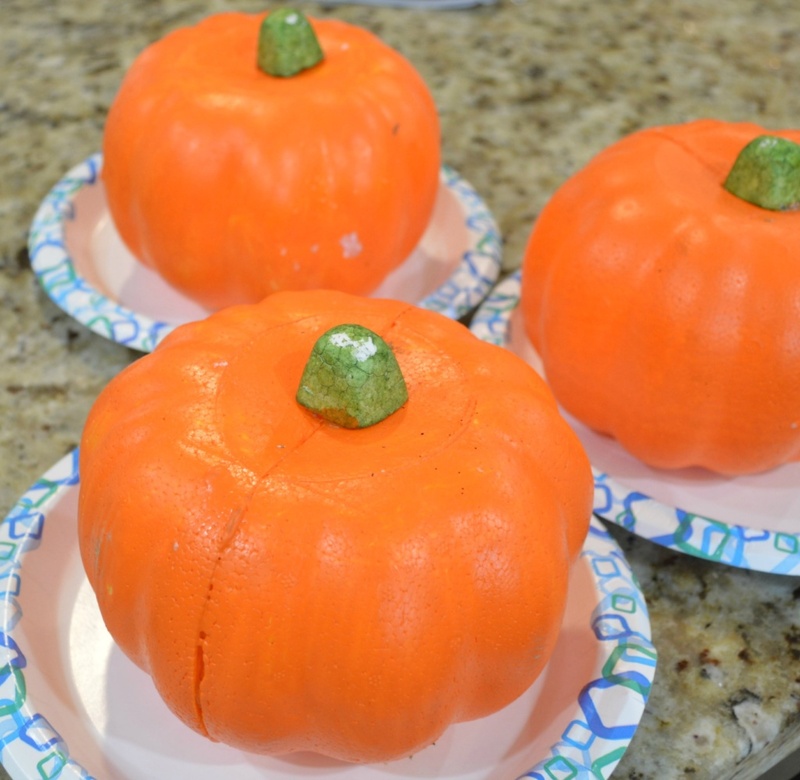 The pumpkins took paint much easier than I thought they would. A couple of coats gave very good coverage. I also painted each stem with the copper paint. For Angie, the rocker chic, you could probably get away with not painting, but I was initially doing something totally different with her, so she does have a coat of paint and I do think it helped hide any bare spots. Give her a coat of the dark blue. Allow the pumpkins to dry before moving on. 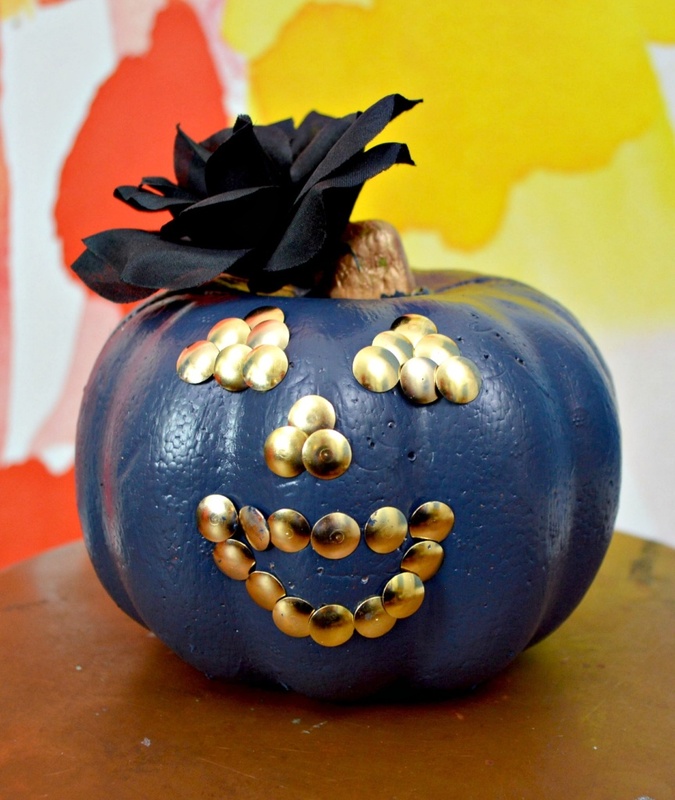 Use the thumbtacks to make a jack-o-lantern face. Pop a black rose in her hair (stem) and your done. 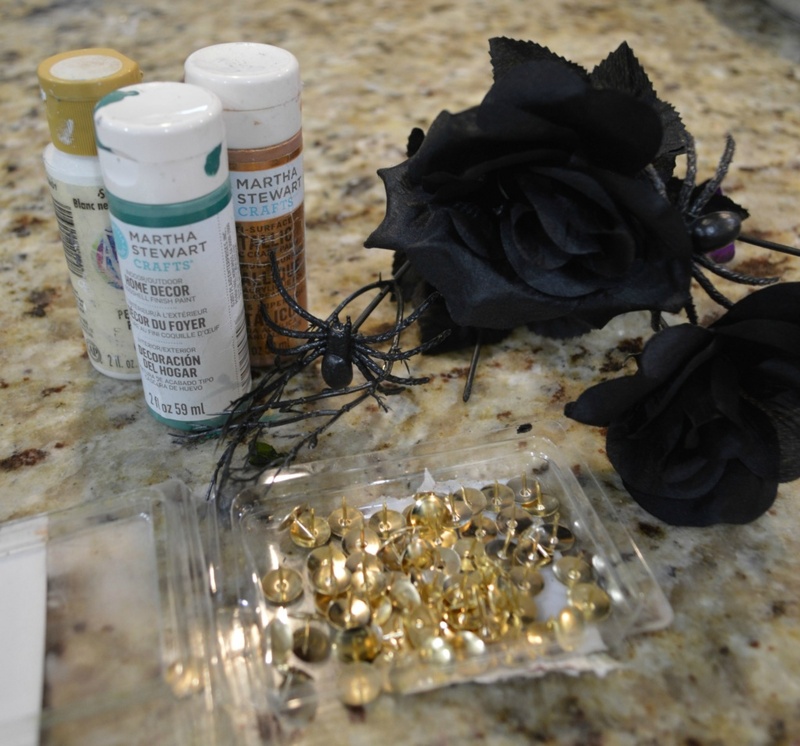 I used hot glue to attach the rose, but if you leave the stem long enough, you can push it right into the styrofoam. Make a wash with your copper paint. I basically squeezed a small amount (less than the size of a dime) into a small cup and then added a drop or two of water to thin the paint out. You want the paint to go on thin so that you can see the green showing through. It gives that lovely patina look and reminds me of the Statue of Liberty. I used a small paint brush to wash the thinned out paint onto Ann. Allow to dry. Actually, Ann is the only one that even needs to dry. These are really a super quick and fun craft and they make such an amazing difference! Which one is your favorite? I have to say I kind of love Angie. But, I don’t want to make Millie and Ann jealous, so they are all my favorite! Wait, my doorbell is ringing… Why do those men have nets and funny looking white jackets?? If you love this post, please put a Pin It!